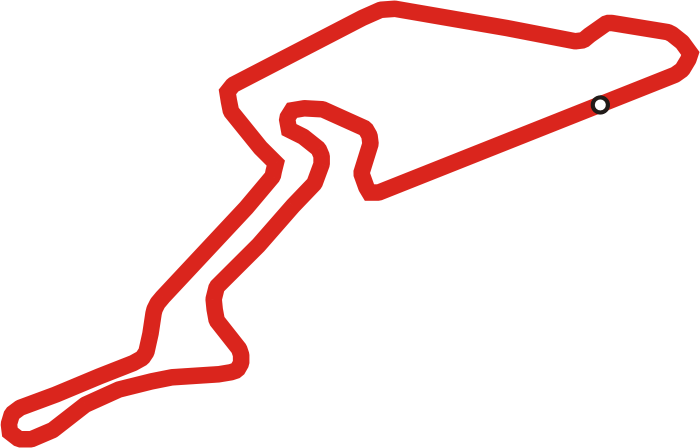 The Nürburgring Grand Prix track (GP Strecke) is also open to the public 6-8pm most weekdays and 10am-4pm on weekends when the track is not hosting an event. While some will argue that the GP track is nothing compared to the Ring, it's challenging in its own right, yet more forgiving thanks to the Grand Prix specification runoff areas. It is 5.1km long and takes about two minutes to lap. You drive your own or a hired car for twenty minutes for €35 and there are about twenty cars on track at any time, similar to a session track day. You can buy more than one slot and just rejoin the track when your session ends. There is no booking system, it is first come first served. 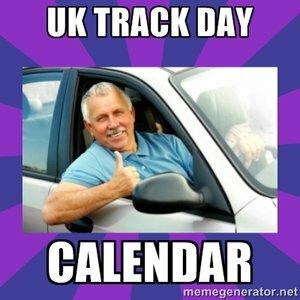 Unlike a normal track day in the UK, you turn up, buy a ticket, and queue up to get on track. I didn't see anybody get a noise test. I went on a weekday night when the Nordschleife was quite busy and got straight into the next session. 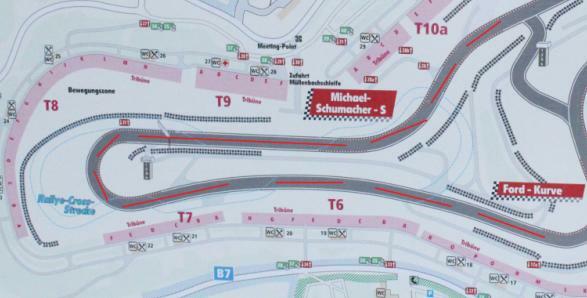 The GP Strecke is accessed by a nondescript road in front of the Lindner Hotel at the Nurburgring Grand Prix track, at the southwestern end of the Nordschleife, near the new visitor centre map. Drive up the road and round the back of the pits, where you will see the ticket office. The official GP track opening times are here or you can call the office toll free from Germany on 0800 0302 112, or from the UK on +49 2691 302 630. When you first arrive at the Nurburgring before your first event, knowing where it’s best to sit for the racing action can be daunting. Where has the best view? Where gets the most full during the weekend? It will all be answered in this section, written by Stephen Kilbey. 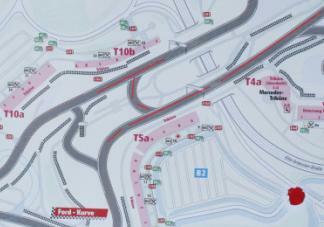 The red lines on the maps under each section indicate what you can see from each point, and tribune is the German word for grandstand. On the majority of seats on the BMW Tribune, you won’t be able to see much else than just the pit straight and a clear view of what’s happening in the pits during a race. However, to the left of the grandstand you can see less pit action and more of the Yokohama S and on the right you can see more pit action and less of the Yokohama S. On bigger weekends like F1, DTM and the Nurburgring 24 Hours it gets very full, since big sponsors usually take this grandstand for hospitality and BMW book most of it for their guests at the Nurburgring 24. For smaller events though this isn’t the case, so getting a seat here shouldn’t be a problem. It should be noted that there is wheelchair access on this grandstand. You can take a lift up from the boulevard and park the wheelchair in the marked bays behind all the seats. The Bilstein Tribune is one of the two best places to watch from at a race weekend. The sheer amount you can see is just fantastic. 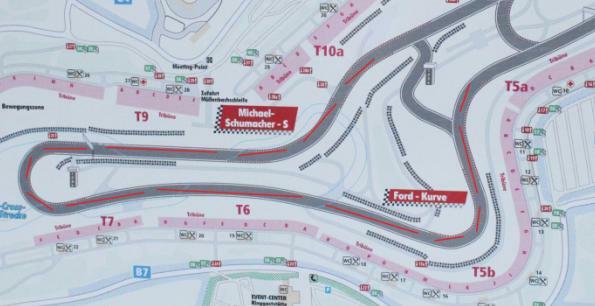 You can see most of the pit straight the whole Yokohama S and the Mercedes arena as well as the Warsteiner Curve. Tickets sell like hot cakes for this stand on big DTM and F1 weekends but other than that you shouldn’t have much trouble as grandstands are usually open access for smaller scale events. It has two tiers so they can pack a lot of people in; no matter where you sit you will be close to the action as well as having the advantage of seeing lots of the track and the permanent screen when it’s in use. Although this grandstand is away from the main boulevard, there are food and drinks on sale immediately beneath which serve much the same as the boulevard. It should be noted that there is no wheelchair access to this grandstand. The Mercedes Tribune is similar to the Bilstein Tribune in terms of what you can see. It’s just from a different angle. It’s great to see the cars coming towards you down the straight and dipping down into the Yokohama S. This is definitely the best view of the first corner. It has two tiers but the top tier is far superior, but there are some seats with viewing restricted by large pillars. This grandstand is also very popular for larger events so if you want the best view you need to book fast. The down side can be that in wet weather, the roof does not protect many of the seats other than the upper tier. The viewing from T5a isn’t the greatest; it’s definitely a cheaper option for the more popular events but other than that, when the grandstands are open access there is no need to view from here unless the sprint circuit is being used. You can see the run down to the Ford Kurve and the sprint circuit hairpin but not much else. These parts are not seated but tiered terraces which have marked-out standing areas used only for large events. There are no food points here, but some are open in neighbouring T5b at larger events. On the plus side, there is good wheelchair access to this area. Tribune T5b is a better option for viewing outside of a large expensive grandstand. Great views of the hairpin are available here and a real impression of how sloped the Ford Kurve is worth seeing. You won’t see too much action here but it’s really close up and this Tribune has a permanent positions board which is really useful for keeping up with the races. It must be noted that in the A, B and C section the viewing is very limited because of the hill section so seeing the hairpin is almost impossible unless you have a step ladder and are very tall. It’s very good to get some close up pictures of the cars without catch fencing. Once again it is a terraced area like the rest of the section leading up to the main hairpin, so there is excellent wheelchair access. Tribune T6 & 7 give you a similar view of the hairpin and the Schumacher S that T5b does but it eliminates your view of the Ford Kurve. 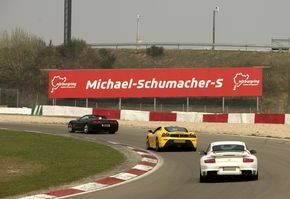 It does have an extended view of the Schumacher S though. This whole section is of course convenient for people staying at Camping am Nurburgring because you can walk straight to it via the residents-only gate at the top of the campsite. Dependent on the weather and the size of the event, a bar and food point may be available and wheelchair access is excellent. These stands are rarely used, in fact just for the biggest events of the year. If you are at a smaller event then you won’t be able to get there but for F1 and the Nurburgring 24 there should be access. 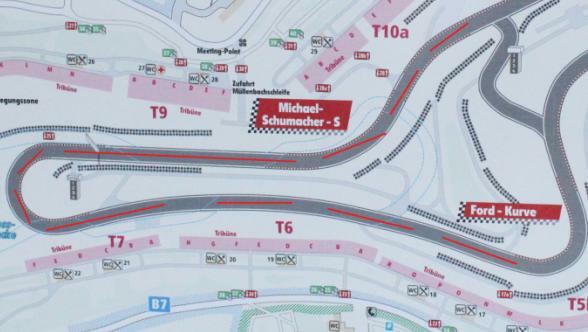 The viewing from tribune 9 is almost the same as T6 and T7 but from the other side with an extended view of the Schumacher S. The view from tribune 8 of the hairpin is top notch because the changes in terrain are more noticeable from the middle.While 10 gives a more clear view of the Schumacher S but not much else. There are food points but they are only in use for big events. Wheelchair access is good also. The viewing from the NGK Schikane is one of the most spectacular parts of the circuit. You can’t see as much as you can from the Bilstein or Mercedes grandstand but you may see just as much action. Not only do you get to see the cars going full speed but you will see them enter the heavy braking zone going into the chicane, this usually is the place where lots of overtaking and incidents occur. Tribune 12a has proper seats while T12 is terraced and has metal bars to lean on. These tribunes are definitely somewhere to go to catch a race after browsing the paddock.